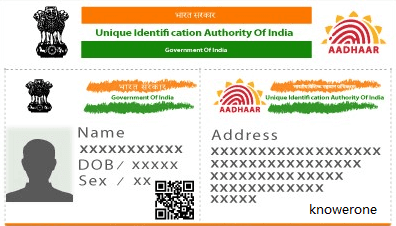 Aadhaar card can be defined as a document, in which 12 digit identification number is confirmed, which is provided to you by the Indian Unique Identification Authority (UIDAI) as a delegate of the Government of India. This number acts as proof of address and identity of people in different parts of India. Anyone can get the Aadhaar card, which includes the card. You can get it by downloading it through Indian post or UIDAI website. Both will be considered equally certified. If you have Aadhar card then you can do property transactions at home. I.e. Property Transaction Paper Holds, Cashless and Human Lace for Holders of Aadhaar Card holders. For this, you simply have to give your bank account, basis, and biometric details. While opening a bank account under the Prime Minister Jhan Dhan Yojna in the country, proof of Aadhaar card is used as the main document of the form. The bank account comes with a large set of benefits like free zero balance savings account, rupee card, accident insurance and more. If you are an Aadhar card holder, then you can avail of e-hospital services. For this, you can book an appointment through Aadhaar card in government hospitals and major private hospitals. While receiving the passport, Aadhaar card will give you relief from the long process. An applicant who uses the Aadhaar card as part of the process card can get the passport within 10 days only. Apart from this, changes in rules and laws have been considered as compulsory documents to obtain a passport. Aadhaar card has been made compulsory for booking orphans in the Balaji Temple of Tirupati, the world's richest temple. This is because a person can worship only once. Aadhaar card has been made compulsory for admission to colleges. If you want to get any kind of scholarship from the government or UGC, then you have to give your Aadhaar card. You will have to give your Aadhar card to open a digitizer under Digital India. By using the Aadhaar card, you will be able to create e-documents by submitting your E-Locker. The EPF has also been linked to the Aadhar Card. For this, you will be able to find your PF and pension sitting in the house. Income Tax Department has given people the facility to e-verify income tax returns through Aadhaar card. That is, you will now have to add an e-filing account to the Aadhar card for complete income tax return. Many states have made the Aadhar card mandatory for vehicle registration certificate, learning license, permanent driving license. Aadhaar card is mandatory for government schemes like mid-day meal, primary health care and initial education for all children running in the government schools. Many mobile connections have been issued on counterfeit documents which are being used for illegal activities by non-social elements. In order to improve the fault of telecom service providers (TSP), the government has instructed them to add all mobile connections with Aadhaar number based on the verdict passed by the Supreme Court.